Trollkatta: DT My Besties Norway Challenge #8 Christmas without red or New Year without blue! DT My Besties Norway Challenge #8 Christmas without red or New Year without blue! Christmas without red or New Year without blue! img958_2 and Christmas Reindeer by Sherri Baldy. Text stamp: Kort & Godt. Snowflakes from Stempelglede heat embossed with gold. 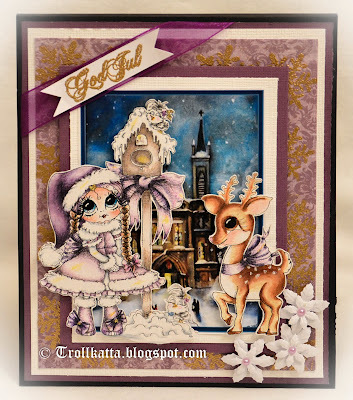 Paper: Maja Design, purple bazill. Dies: Memory Box and Spellbinders. Punch: Floral punch - poinsettia, small and large. Purple ribbon, pearls, sparkle and faux stitches. Wow - Karin dette kortet er bare så utrolig vakkert fargelagt!!! Rådyret er bare helt perfekt! Magnifique carte, quel beau travail. Merci d'avoir participé au challenge Time4Scrap. Just beautiful - love how you've decorated the inside too. Thanks for joining us at A Gem of a Challenge and Happy New Year.